I'm playing BG2EE on Legacy of Bhaal difficulty and some battles are very hard. My team consists of Hadar (Cleric 10 / Mage 11), Keldorn (Paladin 11), Rasaad (Monk 12), Jan (Mage 11 / Thief 12), Neera (Wild Mage 12). Last spot is reserved for Mazzy. Tank with mages, one at a time and protected, hit with pally, monk and buffed cm, withdrawing, the hitters as get targeted, keeping the focus of the golem on mages he can not damage should buy enough time to kill him almost without a scrath, a golem has low apr and needs time to consume stoneskin and images. @gorgonzola I didn't have time to play - my sick leave ended on Sunday. But still only Keldorn has +3 weapon, so must find some easy obtainable weapon for Rasaad (Katana / Wakizashi /Scimitar / Ninjatō) and my Cleric / Mage (War Hammer / Flail / Morning Star) but with Keldorn so easy to hit and without Mazzy yet I don't know which quest I should take now. Has not 4th level spell "enchanted weapon" been markedly improved in EE? It should grant +3 enchantment level even to non-enchanted weapons. You can sneak your way to both Belm and the Flail of Ages without any combat. Belm is only +2, but that's enough to hit a Bone Golem. 1. I'm pretty sure that Bone Golem (at least on LoB) was resistant to +2 weapons. afaik lob changes hp and other things, but don't change the level of enchantment needed to hit a creature. did you got in the feedback messages like keldorn (dice roll and the rest) miss or messages like bone golem is immune to the weapon? the first means that a +2 weapon can hit it, but you don't have enough good thac0 to hit against his ac, the latter that you need a better enchantment weapon. and the best weapon i can think about in that case is the staff of rynn, +4 and on sale in the wakeen promenade. 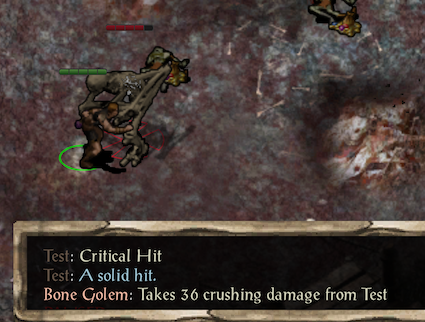 wait, if i remember right to hit a bone golem is possible that crushing damage is needed, which weapons was you using? They have 50% resistance to slashing, piercing, and missile damage. Here's me hitting that particular Bone Golem in LoB mode with a Mace +2. Bone golems can be hit by any magic weapon, i.e. you only need +1, not +2 or +3. As others have said you may find it difficult to hit them because of the -11 adjustment to their standard AC in LoB. If you want to play that, then try using summons - they are enhanced in the same way as enemies, so something like skeleton warriors tend to be better at tanking than your party members. Thanks for your help. Keldorn already has the Gauntlets of Dexterity. And you were right - I've only needed +1 weapons - I probably though that I need +3 because only Keldorn hit bone golem with Lawrence Lilarcor +3 before my charname was dead. :P But tactics with stone skin + ghost armour + animate dead + protection from evil 3 metre + chant+ haste + blur + mirror image and whole party melee attack (on focusing bone golem attack on charname and summoned skeleton warrior) was enough.